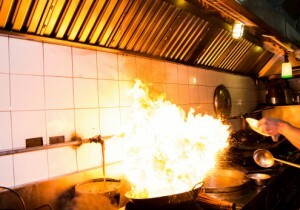 Make sure your staff knows what to do in case of a grease fire in the commercial kitchen. When cooking oil or grease from animal fat gets too hot, it will catch on fire. For vegetable oils, this will happen around 450°F, while lard and other animal fats will combust around 375°F. In a commercial kitchen, a fire on the cooktop is actually the least of your worries. The situation will be much more dangerous if the fire begins in or manages to spread to the interior of your exhaust hood or ductwork, as it can easily travel to other parts of the building from there. Grease fire prevention is absolutely essential in a commercial kitchen, and indeed local Fire Codes demand that commercial kitchen operators comply with specific safety guidelines in this area including proper cleaning and maintenance for their exhaust duct systems. However, despite having all relevant safety measures in place you will also want to make sure your kitchen staff knows these do’s and don’ts for putting out a grease fire. …Turn Off the Unit: In the event of a grease fire on the cooktop, the first thing to do is immediately turn off the heat so that any new splashes of grease or oil will not be heated to combustion point. …Cover the Pot: If the fire is occurring within a pot or skillet, covering the pot can help smother the flames. …Use Baking Soda: If grease has splattered outside the pot or the pot cannot be smothered, pouring baking soda over the flames will also put out the fire. This is a good alternative for minor cooktop flareups as baking soda will not damage the cooktop or contaminate the kitchen with chemicals. …Grab a Portable Fire Extinguisher: In case of a large fire or one that is in or on the exhaust hood, a portable fire extinguisher may be used. Commercial kitchens must have portable fire extinguishers on hand, and the best kind to have is a Class K extinguisher that will release a mist instead of a spray to help extinguish the fire without risk of splashing burning grease to other surfaces. …Activate the Automatic Fire Suppression System: In the event of a large grease fire, the automatic fire suppression system should activate and release a mist of chemicals to extinguish the fire. However, if for some reason the system does not kick on, employees should activate it manually. …Use Water: Water will not put out a grease fire effectively. Instead, it can either splash the burning grease around or vaporize on contact and carry grease particles to other locations, either of which scenarios can lead to another fire. …Move Burning Materials: Moving the pot or item that is on fire is another way to accidentally make matters worse, as grease could splatter and cause injury or additional fires. …Endanger Yourself: If the fire cannot be controlled immediately, or if the warning alarm for the automatic fire suppression system goes off, everyone should leave the kitchen immediately for their own safety.